The deployment of military infrastructure in the Arctic is among the Russian Northern Fleet's priority tasks, and it is currently setting up an advanced reconnaissance system in the area, Russian Northern Fleet Commander Adm. Vladimir Korolyov told journalists. "We are setting up a most sophisticated and diversified situation monitoring system in the Arctic zone now. This objective has been partially achieved, and various components of this system are now monitoring the aerial and surface situation in real time," Korolyov said. "For our servicemen performing their duties on the Arctic islands on a permanent basis to have comfortable service conditions meeting modern requirements and standards, administrative and housing complexes are being built at the places where our units are based," he said. The construction of the Northern Clover closed-cycle administrative and housing complex on the Kotelny Island should be completed this year, Korolyov said. "I'd like to note that this is one of the most advanced administrative and housing complexes in our armed forces now. Our servicemen have lived in it for several months to test all of its capabilities," he said. The complex includes all conditions for the personnel's comfort, i.e. compartment-type living premises, showers, recreation zones, auditoriums, mess halls, a summer garden, a club, a bath, a gym, and other facilities. The complex's infrastructure also includes water-purification and drainage systems, a diesel power station and a transformer substation, garages, hangars, fuel and lubricants storage facilities, a filling station, and automobile storage boxes. The construction of an analogous complex has also been started on the Alexandra Land Island, which is part of the Franz Joseph Land archipelago, Korolyov said. "In terms of the amount of work done, we are nearing the 50 percent level of its readiness," he said. Active work is being done to build modern infrastructure in the community of Rogachyovo on Novaya Zemlya archipelago, where "we are nearing the completion of the construction and expect to have the facility commissioned in the near future," he said. "We have started delivering cargo and accumulating construction materials, so fully preparing for the construction of infrastructural facilities on the Sredny Island of the Severnaya Zemlya (Northern Land) archipelago," he said. "We view the provision of comfortable service and living conditions to our servicemen deployed in Arctic units among our priorities in building the Arctic infrastructure," he said. The Russian Northern Fleet is also actively engaged in combat training in the Arctic, in which all of its components are involved, Korolyov said. "We have prepared the state-of-the-art strategic missile-carrying submarines Yury Dolgoruky, Alexander Nevsky, and Vladimir Monomakh to perform their duties in the Arctic seas this year. The Northern Fleet's anti-submarine aircraft patrol the Arctic Ocean's seas on a regular basis. Our naval and support ships annually conduct Arctic missions. However, we concentrate above all on training shore forces to act in Arctic conditions," he said. "Last year, we conducted an integration tactical exercise of shore forces to train the defense of Russia's island zone and marine coast in the Arctic in interaction with surface forces, which included air defense and missile firing practice. The Pantsir-S1 surface-to-air missile and anti-aircraft artillery system was used for the first time during these exercises," Korolyov said. "We have practiced the landing of amphibious assault forces from large landing ships on an unimproved shore of Arctic islands, and we plan to conduct analogous training exercises on the New Siberian Islands archipelago within the next few months," he said. "However, a multiservice exercise to practice the defense of strategically important economic sites will be the most exciting and intensive event on the combat training program this year. Such an exercise is to be conducted for the first time. It will involve amphibious assault forces and units of the Arctic motorized infantry brigade. During this combat training event, our Arctic units will interact with the Airborne Forces and special units," Korolyov said. "We plan to conduct this exercise near Norilsk, which is a new theater for us," Korolyov said. "We will attach particular significance during the exercises to training the personnel of Arctic units to act in unfamiliar terrain and to testing new types of military hardware, such as all-terrain vehicles and two-section tracked cross-country vehicles, in Arctic conditions. Various crisis situations related to the organization of defense of a strategically important economic facility from various threats, including terrorist ones, will be simulated during the exercises," he said. As to the development of the Northern Fleet, Korolyov said that the fleet's shore-based component has been significantly reinforced over the past half a year during which it has functioned as a multi-service strategic force. "The newly-formed Arctic motorized infantry brigade has joined the shore component, and we have also transformed a marine regiment into a brigade," Korolyov said. "The fleet's capabilities to perform air defense tasks have also been significantly upgraded," he said. "An air defense division and a composite air regiment have joined the fleet. However, this all is only the beginning of significant structural transformations being carried out within the Northern Fleet in view of expanding its duties related to the protection of the Russian Federation's interests in the Arctic. We have started to work on setting up an air and air defense army within the Northern Fleet's composition," he said. Simultaneously, work is being done to improve the structure of command of the shore forces and step up their capabilities, he said. The building of a ramified military infrastructure is continuing on all Arctic islands from the Franz Joseph Land Archipelago to the New Siberian Islands, he said. "It must be noted that, by commissioning the state-of-the-art nuclear submarines, I mean the subs of the Borei and Yasen projects, and by expanding the inventory and logistics basis, we have multiplied the Northern Fleet's combat potential," he said. 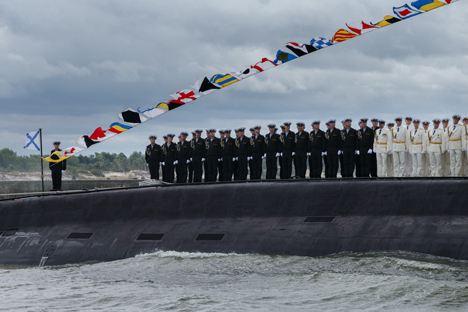 Russia celebrated the Navy Day on July 26.